The most powerful antidote to this common apathy is the classic ArtScroll Mesorah Series book, Tishah B'Av, by Rabbis Avrohom Chaim Feuer and Shimon Finkelman. Rich in historical substance, its poignant insights and profound explanations of Talmudic and traditional sources will inspire you as never before. You will experience this momentous day with deeper understanding and new intensity. The Ninth of Av - On this black day in history, both the First and Second Holy Temples of Jerusalem were destroyed and the surviving Jews brutally sent into exile. Tishah B'Av became a day of repeated tragedies. How was the Jewish nation meant to endure this phase of its history, the stage intended to bring us to the Final Redemption? 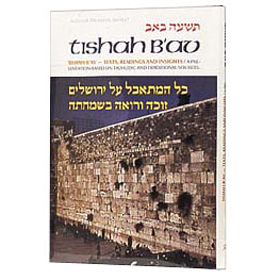 To understand Tishah B'Av is to comprehend Jewish history; to feel Tishah B'Av is to connect with Jewish destiny. Yet even after the Three Weeks of preparation, many people "get through" this long fast day dutifully fulfilling its laws, while missing its spirit and message.